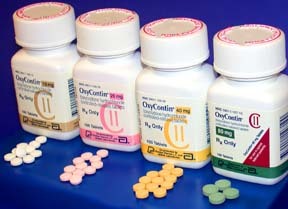 Oxycodone, known by the brand names Oxycontin & Roxicodone, is an opioid pain reliever available by prescription only. This is a narcotic analgesic and therefore a controlled substance. These tablets release medication continuously throughout the day. They affect the way the brain perceives and responds to pain to provide relief from a variety of symptoms. Oxycodone and related medications are provided in tablet form. These tablets come in doses of 10 mg, 15 mg, 20 mg, 30 mg, 40 mg, 60 mg and 80 mg. Oxycodone tablets must be taken whole to control the gradual release of the drug. Oxycodone medications are intended for extended use and should be taken on a strict schedule. You should not use Oxycodone on an as-needed basis. It is important to take the medicine with food. The extended release tablet is usually taken every twelve hours, while the other forms are taken every four to six hours. It is crucial that doses are measured properly, since such pain medications are habit-forming. Doctors may start patients on lower doses, and only increase dosage if severe pain persists. Because opiates are addicting, they are closely regulated by doctors and are not available without a prescription. A variety of other medicines have oxycodone in them. Often it is mixed with other painkillers, like acetaminophen (Endocet, Percocet, Roxicet, Tylox, etc.) aspirin (Endodan, Percodan, Roxiprin, etc.) and ibuprofen (Combunox). These other forms have slightly different side effects, doses, and warnings. It is important to consult a doctor and read all of the accompanying literature before use of any such pain-medicine. Brand names for oxycodone include Dazidox, Endocodone, Oxecta, Oxycontin, Oxyfast, Percolone, Roxicodone, M-oxy, ETH-Oxydose, and OxyIR. Oxycodone is used to treat chronic pain that is moderate to severe. This medication is taken twice a day at carefully scheduled times to sustain a constant release of the drug into the body. Since Oxycodone only treats pain gradually and not instantly, a second medication is often used for breakthrough pain that needs quicker treatment. The danger of serious side effects such as drug abuse typically limits the use of the drug to serious situations such as treatment for chronic pain in cancer patients. Before taking any medicine it is important to tell the prescribing doctor of any medical allergies. Moreover, it is important to mention any other medicines being used because they could react adversely with each other. If a patient is planning to become pregnant or breast-feeding, the doctor should be told of this, as well as if the patient drinks large amounts of alcohol or is having surgery. Basically, the patient should make sure the doctor is aware of any potentially unhealthy behaviors. The patient should also refrain from operating heavy machinery or other dangerous activities until effects of the medicine are known. One of the most important things for a patient to do when taking pain medicines is keep a clear channel of communication with a doctor. Taking pain medications can be habit-forming, so it is important to be aware of potential withdrawal symptoms. If a patient feels odd or continues to experience pain after taking the pain medicine, he should call his doctor.